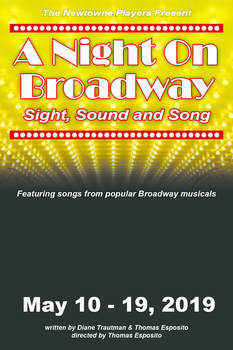 A Night On Broadway: Sight, Sound and Song is returning for its fourth season at Three Notch Theatre. All new songs, new shows, and new cast members, this show is sure to delight Broadway musical lovers of every age! Some of this year’s shows include: Hamilton, Catch Me If You Can, Beautiful, Frozen, They’re Playing Our Song, Aladdin and more. With many musical performances from shows you’ve enjoyed for years as well as some recent releases, you’re bound to hear many songs you know and love; and you may even discover something new to delight you. Written by Thom Esposito and Diane Trautman. The Newtowne Players do not offer refunds on tickets. However, tickets may be exchanged for another performance of the same show or for different shows later in the same season.